This message is from Noberto Sango, a Mozambican who works with Iris Ministries. This is his report on the current flooding. There is very little media attention about what is going on there...today. In answer to the question, Eve repeats what she has been told. 'God has forbidden us to eat the fruit of that tree;...if we do, we shall die.' With compelling assurance the serpent responds, 'Of course you will not die.' The sly one promotes himself as the truth teller and subtly implies that God is the one who misleads. This is ever the deceiver's method of attack: He attemps to erode our faith in the faithfulness of God. The strategems of the evil one are such that we will be tempted in all sorts of ways to believe that the Kindgom has not come near, at least to us. Lying voices try to convince us that we're still strangers to God's love, grace and mercy, that we must still be bound in our sins, that we are still under condemnation, that we are still unworthy. Sun Tzu was right. 'All warfare is based on deception.' Our enemy is ever whispering lies about God, lies about our soulds and lies about our spirits, our minds and our self-images. We're lied to about what's most important in life and lied to about what we really need. We're lied to about our past and our futures. We're lied to personally, corporately and socially. The enemy attacks our minds and seeks to rend our relationships through fault-finding, often with and by those closest and dearest to us. Our spiritual forebears were victimized by this very strategy. 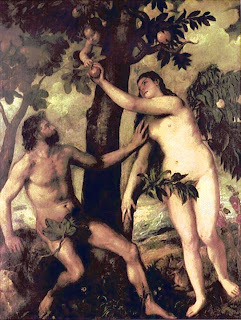 Before the Fall, Adam and Eve enjoyed perfect freedom with one another and presumably took complete delight in one another's nakedness. But once 'the eyes of both of them were opened,' they could no longer be so vulnerable to one another. Perhaps it went something like this. Adam looked down at himself and then looked at Eve. He looked down at himself and looked at Eve again. Then he said, 'Eve, what's wrong with you? Why don't you have one of these?' She looked at Adam, looked at herself, looked at Adam and said. 'I don't know, but I'd rather have two of these than one of those silly-looking things." And with those accustaion, they wounded each other so profoundly that they had to hide themselves from one another. The third deceptive strategy comes agsinst us as the consequence of the second. After Adam and Eve find fault with one another, they try to hide, not just from one another but from God. When the Lord comes calling, Adam defensively answers, 'I was afraid because I was naked, so I hid.' The enemy's influence profoundly distorted Adam's self-understanding so that a sense of fear and shame pervaded.. In this Belial, the 'unworthy one,' ever attempts to impart feelings of unworthiness to his victims. The lie is preempted by his dad's unconditional love and unfailing mercy: 'Quick! Fetch a robe, the best we have, and put it on him; put a ring on his finger and sandals on his feet. Bring the fatted calf and kill it, and let us celebrate with a feast. For this son of mine was dead and has come back to life, he was lost and is found.' Because the Father's love so competely restores all that sin destroys, the feeling of unworthiness have no place or grounding. The dynamics of the Lord's high priestly prayer can appropriately be applied at this very point, not only for the prodigal but to the prodigal in each of us: 'I do not pray you to take them out of the world, but to keep them from the evil one...Consecrate them by the truth; your word is truth.' It is but one aspect of divine mystery that Adam and Eve's eyes were 'opened' when they succombed to decption, yet it is a revelation of truth that redeems, restores and sets us free." just wanted to send another update and ask everyone to keep praying. the riots are still pretty bad all around the city and they say they will get worse tonight. our boys who were out in the city for school made it back. they had to walk for 4 hours and are all pretty shaken up by the violence they witnessed not to mention the tear gas they had to endure. one of the boys who works in my garden, manuel, passed out on the street while walking back and the other boys had to get him up and make him keep walking. the power around the city has been cut off as well. at the center, we are running on a generator but we will run out of gas soon. some of the men have ventured out to try and buy more but all of the gas stations have shut down and many of them have been destroyed. it really is chaos out on the streets. but again i want to stress that i am perfectly safe and all of the children are fine. we have guards that work 24 hours a day and they will be watching the walls very closely tonight to make sure no one comes into the center. please keep praying for peace to be restored to the city. many of the younger kids are quite scared by the gun fire and smoke everywhere so pray that the peace of the Lord would guard their (and all of our) hearts and minds. and continue to pray that the angels of God would surround this center. thanks everyone and i'll update you again soon (as long as the power/internet is still on). love you all!!!! 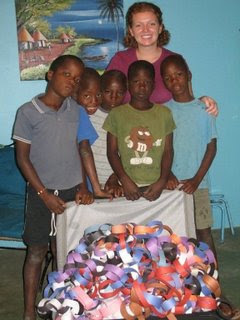 Sarah was my roommate in Mozambique and has returned to Maputo, in Southern Moz as a full-time missionary with Iris. Sarah went to UGA and is from Lawrenceville, GA.